FLAMESHOOTER is essentially a new Flame Thrower, but more consistent on the damage sides although it does look somewhat weak. The Action ability of the Flameshooter turns it effectively into a 2ind/3ind/3ind1/1disr/-/-, and although that's not bad for a 2cost upgrade, it's still limited to yellow characters and does not have Redeploy. It's going to see some play, luckily it's neutral, but I wouldn't rate it too highly. DROP THE WEAPONS is really the heavily upgraded version of Drop Your Weapon! There are even fever play restrictions, as the original card could only be played on a ready character, and there really isn't functionally a bug difference between discarding an upgrade or returning an upgrade to your opponent's hand. It's in any instance going to be extremely disruptive to your opponent's game plan. 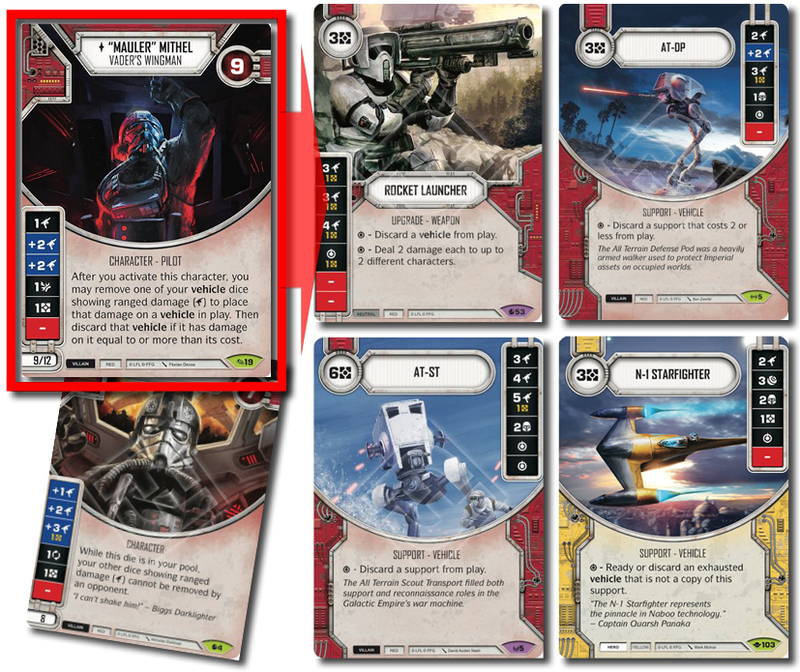 KNIGHTS OF REN also released spoilers during this week as well as a recent podcast discussing them. BLACK TWO, "Mauler" Mithel's Tie Fighter flanking Darth Vader in the destruction of the Death Star scene in A New Hope adds to the ranks of villain vehicles (remember that we already had the 'rank and file' TIE Fighter spoiled). Black Two does not look particularly impressive compared to the First Order TIE Fighter, unless you add "Mauler" Mithel to the character line-up in which case it's a pretty hard hitting piece of machinery. It does have 4 damage sides though and we have already learned in the Way of the Force meta not to underestimate the power of Indirect damage. It is only the three Ranged damage sides that benefit from "Mauler" Mithel though, but is a definite must-include with him! "MAULER" MITHEL apart from synergising with Black Two and boasting a die somewhat comparable to the TIE Pilot, has an ability in line with a number of upgrades and supports, that aim at neutralising the danger posed by vehicles. It is limited to vehicles, but is an "After Effect" and is actually much more powerful than the Special on AT-STs, Rocket Launchers, etc. It doesn't require much to get rid of small vehicles. "Mauler"s special ability has pushed his points cost a bit and coming in at 9/12e and just 9hp he's a bit expensive, but should still be able to force himself into some competitive lists. 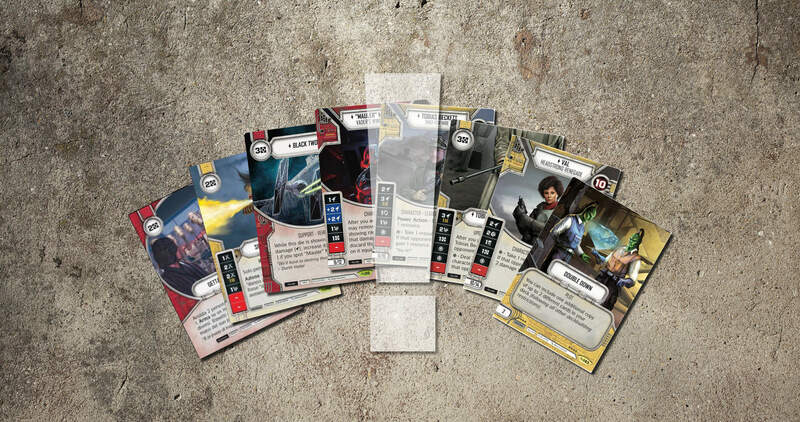 Last content creator team to release spoilers this week (so far) was the cool peeps from TEAM COVENANT, and Zach Bunn put together a great article for their website as well. TOBIAS BECKETT is an interesting character who best compares to Han Solo (as well as Bossk and Awakenings Count Dooku) in terms of points cost, and boasts an INCREDIBLE powerful Power Action. His second character die is expensive (4 points) compared to characters like Snoke (11/13e) who pays only 2points for the second die, but he also brings BOTH a Power Action AND a Special Ability. His die is what you would expect from a character his cost and although a payside is normally prohibitive, his Power Action - essentially an always active Truce - makes up plenty for this downside. Giving your opponent resources is not really something you want to be consistently doing unless you have a plan in store for utilising those resources more efficiently than your opponent! Or as is the case of Tobias Beckett stealing them back! 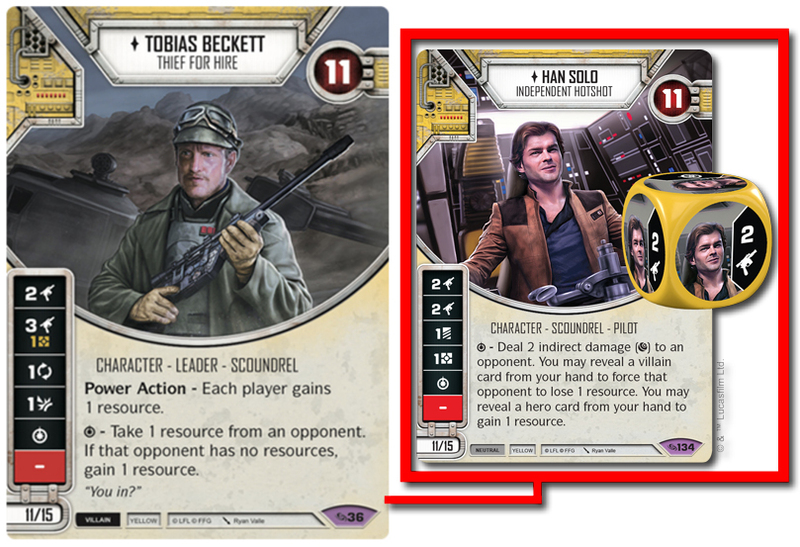 He also works pretty efficiently with Han Solo, using the Beckett Power Action to give a resource to both players, then next turn revealing a villain card from your hand with the Han Solo Special to force your opponent to lose that resource again (provided that it's not already spent). It's of course a lot of work in doing what a single Salvage Stand could do for you! I like how Across the Galaxy looks to go all in on synergetic plays and interactions, but most of it looks somewhat inefficient ... but we are of course still far away from a fully spoiled set. A lot can still happen! 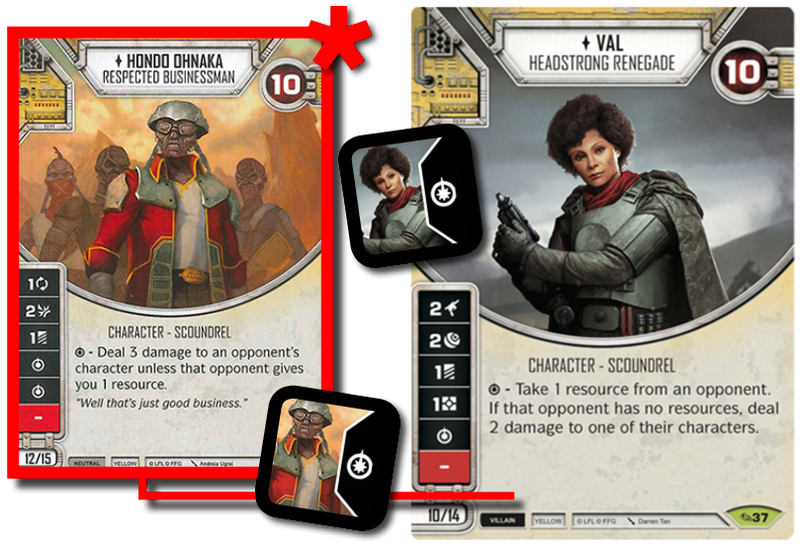 VAL - HEADSTRONG RENEGADE seems to synergise well with Hondo or Beckett, but once again it is with the suspicion that the synergies that are so obvious are in fact forced, clunky and inefficient. BUT any plays where you starve your opponent of resources, and punish them simultaneously are pretty powerful! Val coming in at 10/14e could definitely see some play. Her obvious partners are yellow villain characters (Boba Fett, DJ, etc. ), but I don't fancy monoyellow decks, which then makes it a bit less obvious where she slots in, because normally you'd want two character dice on any character with a powerful Special showing on their die! TOBIAS BECKETT'S RIFLE is bad and probably not where you want to be at with a 3cost upgrade. Sure, it has a nice effect when played on Tobias Beckett, but he already has a payside, the Rifle has another payside, and does not have Redeploy. Compared to upgrades like Dagger of Mortis or Rey's Lightsaber, Tobias Beckett's Rifle looks pretty mundane (and to top it off it's Villain only...). The internet sort of exploded discussing the new Plot card DOUBLE DOWN. At a glance this card is pretty insane considering we are dealing with 30 card decks! Where I see the biggest swing is actually in the initial draw, where chances of drawing into a specific card is made significantly higher with 3 copies in a 30 card draw deck compared to 2 copies. The numbers represent the clean draw, no mulligan. Whether or not it's going to make as BIG an impact as some players are concerned about is still not entirely clear to me. I think we are dealing with a card pool which quality wise is getting so strong that there are very few cards that are so powerful that I NEED 3 copies of it! It will make combo-decks stronger though! 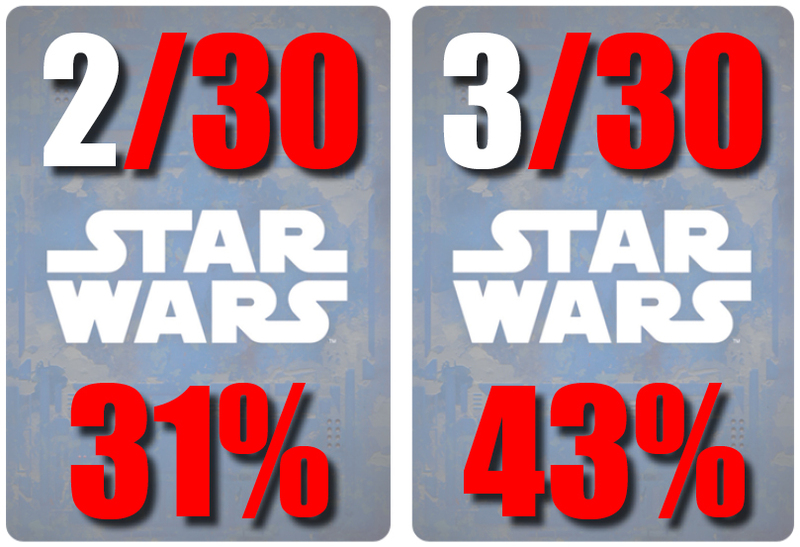 Check out our other Across the Galaxy Spoiler articles here!